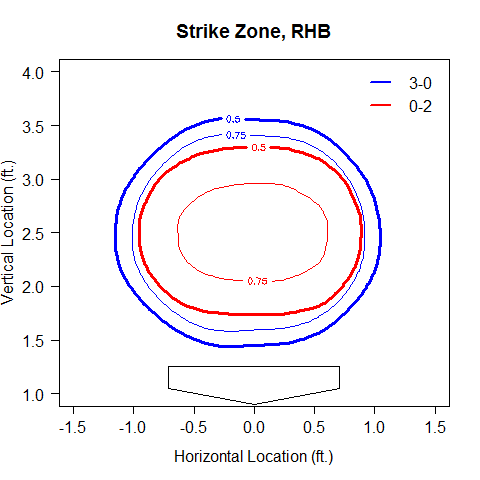 I recently became fascinated with the strike zone and its effective boundaries. The strike zone laid out in baseball’s rule book is simple; it extends a total of 17 inches across the width of home plate, between the hitter’s knee and midsection and covering the entire depth of the plate. The strike zone as it actually gets called by umpires is complex. It shifts quite significantly depending on the handedness of the hitter for one. That’s not the whole story though, not even close. The dexterity of the hitter isn’t the only significant variable in how the strike zone is called. Compare the following two strike zone heat maps, fitted from 2012 data on called pitches to right-handed hitters. The strike zone in 3-0 counts (sample size (n): 3,665 called pitches) has an area of 3.73 square feet (sq. ft.) while the strike zone in 0-2 counts (n: 12,339) shrinks down to 2.39 sq. ft., a size about 64% as big. Interestingly, the zone does not appear to constrict itself equally, but rather by getting shorter (vertically) slightly more than it gets skinnier (horizontally). Look at this possibly overcrowded contour overlay. I super imposed both the 50% threshold and the 75% threshold to show just how much it shrinks. Coincidentally, the 75% level in 3-0 counts is close to, but notably still larger than, the 50% level in 0-2 counts. That means that a pitch that would be a 50/50 toss-up when thrown in a 0-2 count would be called a strike about 85% of the time if the count had been 3-0 instead. 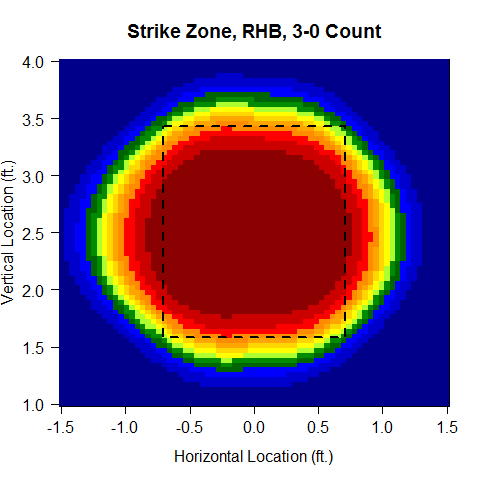 Strike zones in 3-0 counts are called over a larger area than in 0-2 counts. That is neither new nor surprising information. What I wanted to do was get more specific though and so I broke apart the 2012 data sample by both hitter side and count, fitted strike zones to each of the 24 categories and then computed the area of the zone, in square feet, created by the 50% threshold. There were two points I immediately took away from the list. First is that the right-handed strike zone is almost uniformly larger than the left-handed one. 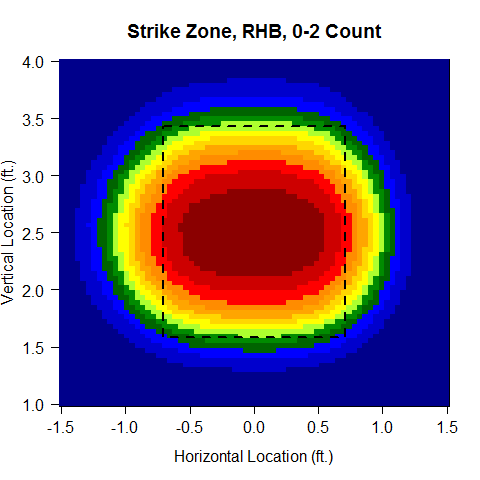 There were only two counts where left-handed hitters faced a larger 50% strike zone: 1-2 and 2-2. However, with 0-2 counts were nearly identical, an interesting but unexplained grouping emerged; counts with two strikes saw a much tighter zone called on right-handed hitters than to their lefty counterparts. Secondly, I expected that the zone in 0-0 counts would be fairly neutral compared to the other counts. Instead, it was firmly in the pitcher’s favor. Ordering the counts by their average size places 3-0 at the largest, no surprise, followed by 2-, 1-0 and then 0-0. Counts at 3-1 actually showed a smaller called zone than first pitches. We hoped you liked reading The Size of the Strike Zone by Count by Matthew Carruth!